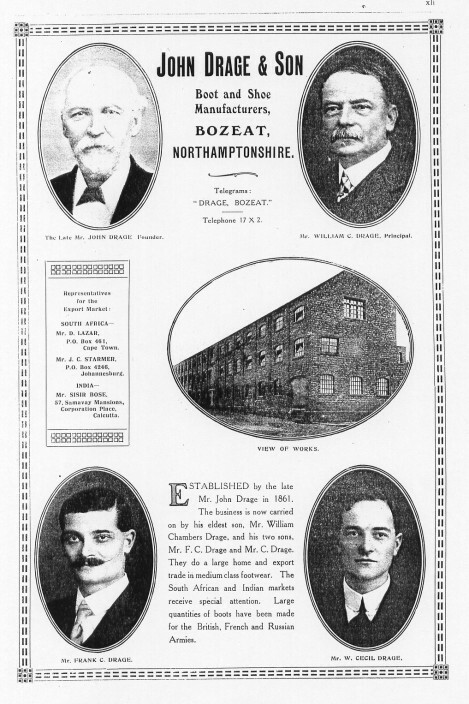 The establishment of the factory system in Bozeat will always be associated with the name of John Drage and his brothers. About 1870, it is said, John Drage built Arch Villa (now the Paper Shop) and encouraged men to leave the land and learn the trade of shoemaking for which instruction they were charged £1. When the Old School at the bottom of Mile Street was closed in 1873 and the children were moved to the new Board School in Camden Square, John Drage took it over as an extension of his business and his premises. Towards the end of the century he was making heavy boots, lighter men’s boots, school boots, football boots and tennis shoes. He was assisted at the time by his sons, W. C. Drage and J. E. Drage. According to a published report he had a good export business to the colonies which were then demanding Northamptonshire footwear in great quantities. John Drage’s brothers were well known in the village and district and all were connected with the Boot and Shoe Trade. William Drage started his business in some small cottages on the left hand side of the road going from Bozeat to Olney. Henry Drage was more of a boot manufacturer and also took an interest in farming. Joseph Drage, the youngest of the brothers, married the daughter of the Olney boot manufacturer and was manager of the Boswell business as long as it lasted. Other shoes being made were ‘Elastic Sided’, which came into fashion about 1837, Balmoral shoes, School Boots, Football Boots and Tennis Shoes. The first enlargement of the factory took place in 1914 at the outbreak of the Great War, a common period of expansion across the county. The trademark of the business ‘Honest John’ (photos) is said to have originated in the fact that John (now a grandfather) paid his creditors 20/- in the pound following his earlier bankruptcy. Within living memory the factory was making shoes for light wear, as well as heavy footwear, such as boots. 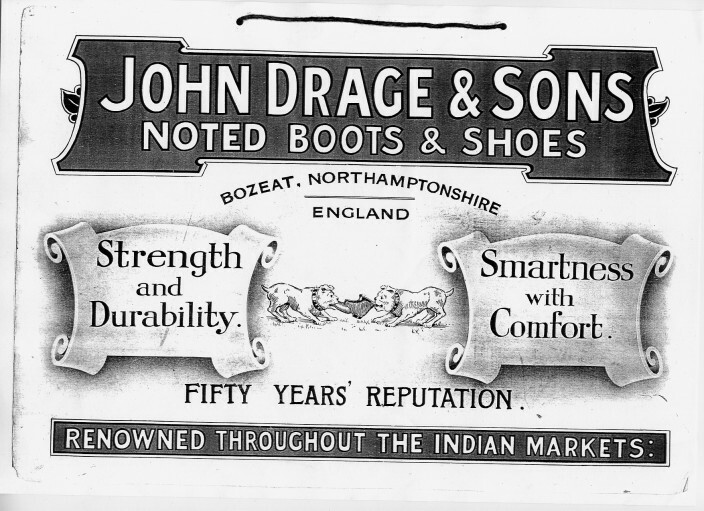 In the late 1940s, Spencer Clarke of Northampton became the owner of both the Drage shoe business and the Bozeat Boot Company. 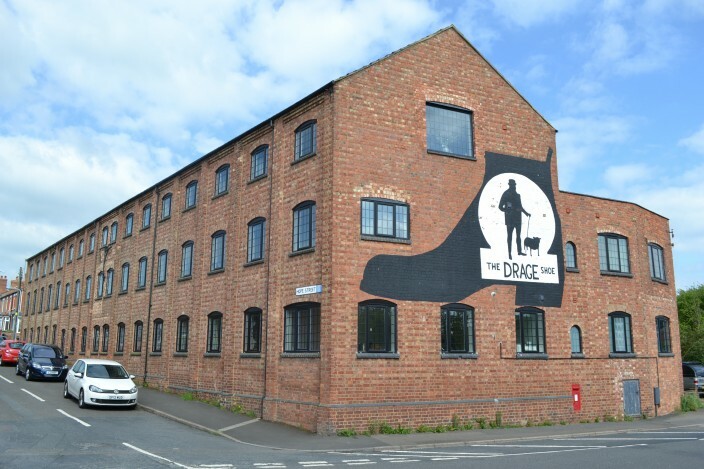 The company continued to operate in the factory in Hope Street until 1972 when Mr Caswell moved it to Kettering where it still trades under the name of The Drage Shoe Company. Today the memory of the Drages in Bozeat lives on through the giant painting of a boot and John Bull on the side of the former London Road / Hope Street factory which was first created on Feast Day c.1932 by Jack Walker, a local painter and decorator. The painting became a landmark for the village before it was painted over by a later owner of the factory, however remained visible in outline and for the year 2000 was been repainted by Mr Steve Linnell. Credit: Norman Palmer with supplementary information by Philip Bligh.